Beta Analytic attended the 3rd Global Alternative Fuels Conference for Cement and Lime held in Toronto, Canada, from June 15 to June 16, 2009. The conference at the Sheraton Centre Toronto was sponsored by the Cement Association of Canada. The main themes during the conference were fuel supply and pricing trends, fuels handling and storage, emissions trading, fuel processing, process efficiency of fuels, combustion efficiency, and reducing electrical consumption. The conference also included sessions on practical aspects of the use of biomass as a fuel in cement and lime industries and methods for decreasing specific electrical consumption. Beta representative Mauricio Larenas talked about howASTM D6866 can quantify the biomass fraction of carbon dioxide emitted by cement and lime plants. The application of ASTM D6866 to derive “biomass CO2 content” for carbon dioxide effluents is built upon the same concepts as those used by the USDA to derive the biobased content of manufactured products containing biomass. It is done by comparing a relative amount of radiocarbon (carbon 14) in an unknown sample to that of a modern reference standard. The ratio in contemporary biomass will be 100%, and the ratio in fossil materials will be zero. 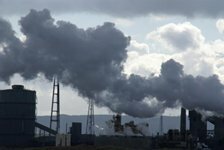 Carbon dioxide effluent derived from combustion of 100% present-day biomass will yield results of 100% renewable content while those derived from the combustion of 100% fossil fuel will yield results of 0% renewable content. Carbon dioxide produced from mixed fuels (biomass plus fossil fuel) will yield a percentage result in direct proportion to the biomass carbon vs. fossil carbon consumed in the combustion.